The 2012 United States Mint America the Beautiful Quarters Proof Set™ is the third year in a row in which the US Mint has released a proof set containing just the strikes of the America the Beautiful Quarters® Program. This set contains proof quality examples of the five 2012-dated America the Beautiful Quarters honoring five different sites of national interest from around the United States and its territories. The five 2012 quarters honor El Yunque National Forest of Puerto Rico, Chaco Culture National Historical Park of New Mexico, Acadia National Park of Maine, Hawaii Volcanoes National Park of Hawaii and Denali National Park of Alaska. Each coin in the set is struck to proof quality at the US Mint’s facility in San Francisco. The above coins represent sites of national interest located within the states or territories of Puerto Rico, New Mexico, Maine, Hawaii and Alaska, respectively. The five coins of the set are encased together in a protective lens to preserve their finish. This lens is then inserted in a colored box imprinted with the title of "2012 United States Mint America the Beautiful Quarters Proof Set™." This set was released for sale to the public on January 17, 2012. 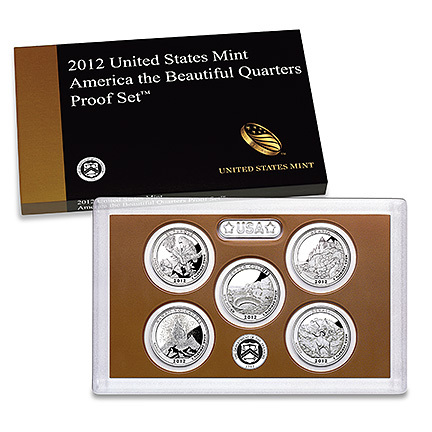 The 2012 Quarters Proof Set was originally offered for $14.95 per set. Each coin in the set should be struck at the US Mint’s facility in San Francisco. A portrait of George Washington designed by John Flanagan is featured on the obverse of each America the Beautiful Quarter. The image of the first President of the United States was initially used on the 1932 circulating quarter dollar. The reverse of each quarter contains designs emblematic of the sites of national interest chosen to be honored for the year.